Google News is a great tool because I can easily find all the relevant news on these favorite topics, and the homepage helps me get a quick look at what’s going on in just about every subject one should be versed in when it comes to current events (world news, politics, sports, etc.). Usually if something particularly interesting or shattering comes along, I’ll immediately trek to the CNN website to get an in-depth (and comparatively balanced) report. But when I’m not looking for balance, I have to turn to Fox News (though I rarely read its website). This is a habit I inherited from my father, a big Bill O’Reilly fan. However, unlike my dad, I’m not merely looking for a channel that will only reinforce my beliefs, but challenge them. I agree with some of the decidedly conservative values the network has but those are few and far between, and I like to get alternate perspective. Plus, there’s nothing like watching Glenn Beck rant and cry. 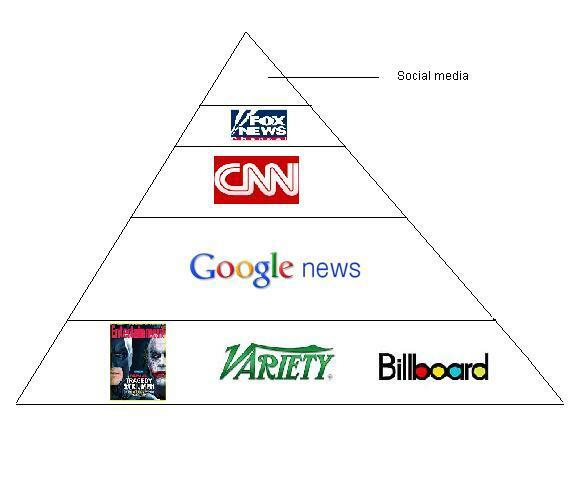 At the top of the pyramid, I included social media. I’ve often been accused of being way behind when it comes to this; I didn’t sign up for a Facebook account until I was forced to as part of a group project for a class. I see the value in these sort of tools but usually only log in as a reactionary measure to see what people are saying about the news; not to learn it.